Today, I want to introduce you to Carl Richards, one of my favorite financial advisers on the planet. You might be familiar with his sketches, which have been seen on the New York Times. I asked him to write up a detailed account on the psychology of investing. And if you read to the end, you’ll see a little surprise just for IWT readers. * * *Successful investing is hard. Not complicated, just hard. It’s hard because for the most part, we are wired to make the same mistake over and over again. We buy high and sell low because that’s what everyone else is doing. But like any problem that needs to be fixed, the first step is recognizing the problem and then coming up with a plan to prevent it. We don’t have to look too far to find ample evidence of poor investor behavior on a wide scale. In 1999 when the dot-com bubble got bigger and bigger, the NASDAQ was up over 85 percent…FOR THE YEAR. That was crazy enough, but what happened in the first quarter of 2000 was insane. We went on a buying binge, all of us. Up until January 2000, the record for net inflows (money going in, minus money going out) into stock mutual funds was $29 billion. Now here we were in January 2000, right after an 86 percent run up. Look at these numbers. In January $44.5 billion poured into stock mutual funds. In February, the shortest month of the year, inflows hit $55.6 billion. That’s almost $2 billion a day! And March was nothing to sneeze at either with an investment of another $39.9 billion. Think about it. Over three months, $140 billion dollars entered the market—AFTER it already had gained over 80 percent. At a time when we should have shown some caution, we allowed ourselves to get swept along with the crowd, and we paid for it. March 24, 2000, was the peak of the dot-com bubble, and by October 2002 the market had lost 50 percent of its value. So had we poured money in, just in time to get our heads taken off! If the behavior at the top was wild, clearly we still hadn’t learned the lesson on the way down. With the S&P 500 down over 50 percent from its highs, we couldn’t sell fast enough. October marked the fifth month in a row that investors pulled more money out of stock mutual funds than they invested. That had never happened. I repeat, never. October turned out to the market low. So at the market low, instead of buying equities at the best “sale” prices in five years, investors moved their money into bond funds, making the classic mistake of having bought high and sold low. Bond funds experienced a record inflow of $140 billion in 2002, at a time when bonds where at 46 year highs. How many of us became a real estate investor in 2006? Are we buying gold now? See the pattern. Once we recognize the problem we can fix it. The first step is to have a thought-out investment process that we can stick to when things get tough. Investing involves risk so no matter our investment process so there will be times that we are tested. There will be times we are tempted to go to cash, “just until things clear up” like some did in 2002. But the only real hope of sticking with an investment strategy is to understand it at least enough to have the confidence to stay disciplined when times get tough. This is a great first step and I know it is nothing new. It is well documented that 80 percent or more of the actively managed mutual funds out there underperform their index. So why pay for underperformance? Betting on a particular industry or sector. We see this in the form of trying to pick the next hot sector, like technology, banking, or oil stocks. It’s super common for people to think they can do this, but they can’t. Market timing. We all know on a theoretical level that market timing is a loser’s game, but we’re often quick to latch on to anything that might look like detailed research about the direction of the markets. Just remember that forecasts are nothing more than guesses, and you need to stick to your plan. Owning individual stocks. While it’s certainly not impossible to identify the next Apple, history proves that it’s highly improbable. Placing large, concentrated bets on individual stocks can be a path to incredible wealth, but so can a single spin of the roulette wheel (if you get lucky). Diversification is the closest thing we can find to a free lunch in finance. The magic of diversification is that you can take two risky assets, and when you blend them, the result becomes less risky because they zig and zag at different times. To demonstrate this let’s look at two portfolios. Portfolio A is invested 100 percent in United States stocks, as measured by the S&P 500-stock index, and Portfolio B is invested 100 percent in international stocks, as measured by the MSCI EAFE index. We’ll use 34 years (1976-2010) for our sample period since it’s the longest period available for which we have data from MSCI EAFE. Now let’s look at the risk associated with each of these hypothetical investments. Although there are many ways to view risk, for our purposes we’ll focus on the number of negative quarters and volatility as measured by standard deviation (the lower this number is, the better). From 1976-2010, the S&P 500 had 42 negative quarters and a standard deviation of 15.39 percent. International stocks had 45 negative quarters with a standard deviation of 17.26 percent. As you can see, each of these portfolios appears risky individually. But the magic of diversification is that when we blend them, the whole is better than the sum of its parts. So let’s create Portfolio C using use a fairly standard 60 percent allocation to the S&P 500 and 40 percent allocation to international stocks. Now this portfolio gets a return of 11.21 percent. While that’s not much better than the S&P 500 alone, in terms of risk, this 60/40 portfolio only had 37 negative quarters with a standard deviation of 14.45 percent. That may not sound like much, but it is indeed a free lunch. This portfolio returns at a higher rate with less risk using the simple concept of diversification. When I talk about diversification, I often get told that it’s been irrelevant over the last 10 years, particularly during the global credit crisis in 2008-2009. Sure, you can see the benefits of diversification clearly when you’re focused on different types of stocks. But in times of large systematic risks to the stock market (like what we’ve seen during the last five years), the value of diversification among equity asset classes can often go away. So while it’s still a valuable exercise to carefully plan your equity portfolio to take advantage of a free lunch where you can, the real power of diversification comes in the form of risk reduction when you start to mix stocks and bonds. Let’s compare the 60/40 stock portfolio we built above (Portfolio C) to a portfolio where we add 40 percent in bond exposure. Remember that Portfolio C generated a return of 11.21 percent with 37 negative quarters and a standard deviation of 14.54 percent. When we blend in a 40 percent allocation to bonds (in the form of the Barclays Capital Aggregate Bond Index), creating Portfolio D, we get a return of 10.4 percent. That’s not much lower than the all-stock portfolio, and we reduce the number of negative quarters to 35. But the real impact is in the risk reduction we see in the form of much lower volatility as measured by standard deviation at 9.48 percent. In other words, the ups and downs of Portfolio D will be much less sharp than Portfolios A, B, and C.
While I’m not suggesting that this portfolio is right for every individual or serves as a predictive model, the historical data at least show how being diversified can give you a way to protect yourself from many of the random events that have ruined fortunes. So now you’ve got your new portfolio, what comes next? It’s time to automate some smart behavior. And one task that too often gets skipped or ignored is rebalancing. The main purpose of rebalancing is to periodically reset your portfolio back to the original split between stocks, bonds, and other investments. All you’re trying to do is keep your portfolio investing risk roughly the same as what you started with. Most people seem to follow two rebalancing philosophies: do it according to the calendar, say once a year, or do it when you reach a certain trigger point, when one portion of your portfolio grows or shrinks outside of a predetermined range. Either philosophy can be automated to happen without your interference. Here’s an example of how rebalancing might work. Let’s say you sat down in 2006 and decided that based on your goals, the right portfolio for you was the hypothetical Portfolio D we just reviewed, 60 percent in stocks and 40 percent in bonds (high quality, short-term bonds). As part of that process, let’s also assume that you committed to rebalancing your portfolio back to that original 60/40 allocation whenever your portfolio balance strayed too far from it. At 60/40, your portfolio allocation represented the amount of risk that you felt you needed in order to achieve the return necessary to reach your long-term goals. Fifty percent in stocks would be too little to meet your goals, but 70 percent in stocks represented more risk than you felt you could take. Fast forward a few years to the meltdown of 2008-9. If you went into 2008 with 60 percent of your money in stocks and 40 percent in bonds, then as the market dropped, the composition of your portfolio would have changed from the original 60/40 allocation to something different. We’ll also assume that nothing else in your life changed and your goals remained the same. The only thing that changed was the market. For our example, let’s assume that you’re using a trigger point to rebalance. Since it’s pretty common to rebalance when your portfolio allocation strays more than five percentage points off of your target, when the market fell in 2008 you would have rebalanced when your portfolio hit 55 percent in stocks and 45 percent bonds. That would have meant selling bonds to buy more stocks. Rebalancing is not a scientific way to time the market, nor is it a magic bullet to increase your returns. It is true that disciplined rebalancing could result in slightly higher returns, but it could also lead to slightly lower returns depending on what the market does. Rebalancing also does not automatically decrease your investment risk, but again, depending on market conditions, it may slightly increase or slightly decrease your risk over shorter periods of time. While there is plenty of debate about how to rebalance and the pros and cons of rebalancing, there is one clear benefit to employing a disciplined rebalancing strategy: it prevents you from making the classic behavioral mistake of buying high and selling low. Warren Buffett has said that the key to investment success is to be greedy when everyone else is fearful and fearful when everyone else is greedy. As we all know that is super hard to do. It was really hard to buy in March 2009. It was also hard to get yourself to sell in December 1999 or October 2007. But if you had committed to rebalancing that is exactly what you would have done. Not because you were a market whiz and not because you knew what the market was going to do. Instead you rebalanced because it made sense to stick with your plan. Rebalancing is the only way I know of to give yourself the highest likelihood of buying low and selling high in a disciplined, unemotional way. Rebalancing reminds me a bit of the simple checklists used by doctors. I remember going in for a routine surgery that was going to be done on the left side of my body. When I went in for surgery, I met with the doctor who knew exactly what side of my body she was operating on, but as part of her checklist, she asked me again during pre-op. After she left, no fewer than four different people came in with my chart and asked me which side they were operating on. Each time I answered the left side, but I became increasingly curious about why they were asking me so many times. Then, as I was on the operating table and before I was put under, the doctor who I had just seen the day before asked me which side she was operating on and then handed me a Sharpie and asked me to mark the side. When I saw her a few days later as part of my post-op visit, I asked her why they had followed such a procedure. She told me it was a simple checklist to keep them from doing something really stupid, like operating on the wrong side. It took them an extra minute or two and a Sharpie to avoid what would obviously be a huge mistake. And that’s the real magic of rebalancing; it becomes our investment Sharpie. Nothing of outlined in this post is particularly difficult. It may take some time to work through the different options and determine the one that fits you best, it’s all doable. Too often I see people look at the tools available to them and then walk away because they don’t want to do the work. We have options, but whether it’s emotion, bad habits, or other road blocks, we end up missing opportunities to achieve our investing goals. Successful investing is hard, but the benefits to those that stick with it are so big, how can you walk away from it? That is a great post to give us work before Christmas. I just bought the book. Carl says to sell high to buy low when rebalancing. In your book, page 205 in my version, you said you hate selling while rebalancing. Did you change your mind or do you still encourage us to buy more of the underperforming assets? If so, when do we sell high if we never sell? Per Ramit’s advice, I’ve opened a target date retirement fund through Vanguard. I’m self employed, and am able to max out the ROTH IRA. 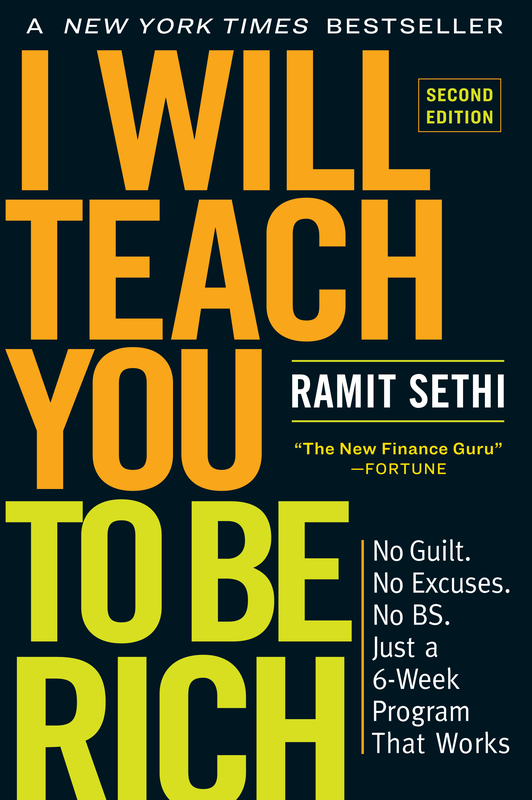 My question for Ramit and the rest of you is what other index funds would you recommend for someone in my shoes? I purchased the Vanguard REIT fund in a regular taxable account and intend to hold it for quite some time. I just didn’t want significant overlap in my investments so I wanted to get informed opinions. Thank you in advance. REIT is extremely tax INefficient, which means you’d be much better off investing the fund in tax deferred accounts. You’re better off thinking of all of your investments as one large portfolio so you know how when and how to rebalance your portfolio. If you’re already sold on index funds, do a google search for ‘bogleheads’ for additional resources for investing advice. I suggest you make sure your investment matches your intention. For instance, a REIT gives you a type of real estate exposure but correlates most closely with small cap stocks. Were you looking for RE to supplement your target date or more small cap? Vanguard has some great balanced and target date options for after tax funds. Nice to have a team of professionals determine stock/bond allocations and do all of your rebalancing and dividend reinvesting for you! I use the target date funds for my 401(k), 529 and after tax since it’s just me without the monitoring tools or time to devote to reallocating. Chetan, from what I’ve read elsewhere, if you’re buying a target retirement fund, it’s not a good idea to mix other index funds with it, because the target retirement fund has a set allocation that most likely includes a mix of index funds, and by buying other index funds, you’re messing with the allocation. For example, let’s say your target retirement fund has a 60/40 equities/bond mix. By additionally buying other funds, your total portfolio would have a 65/35 mix. Your target retirement fund also automatically rebalances for you, so if you were to buy other funds, you’d have to take rebalancing into account. Angela & Joe…Thank you for the replies. some of the advice correctly. He suggested that after you contributed as much as you can to your ROTH IRA & 401k (401 isnt applicable to me), you should invest the remainder in a regular taxable investment account. So, since I had a few funds left over to invest AFTER my Roth IRA (Target Date Retirement Fund), I invested the remainder in a regular taxable account (Vanguard REIT Index Fund). What funds would you recommend for a regular taxable investment account? I just poked around in Schwab for some way to automate rebalancing, but no dice. Definitely seems like a useful tool brokerages could implement. (Maybe Ramit with all his clout could lean on them to get something made?) I guess with a little work I could make a spreadsheet to speed up rebalancing, but wouldn’t it be nice to not have to? If you use Google Docs search the public templates for “Portfolio Rebalancer Template”. Then if you want to make it even easier, in the spreadsheet go to Tools, then Script Gallery and search for the script titled “Stock Price” which will auto-fetch stock prices from Google Finance. Click install then go to the Script Manager, click run, authorize it, and click run again to insert it into the spreadsheet; it will need the first 4 columns empty else it will overwrite them. If the script doesn’t auto-update when you open the spreadsheet, run it from the Finance menu drop-down. This post is very dangerous. The drawdowns (amount lost from the highest point in your equity to the lowest point) can be quite high. Does this limit the amount of volatility in your portfolio? to an extent, yes. The idea that market timing is a fools game is far beyond the truth. There are many advisers and traders that have been very successful in timing the market to some extent. What’s important is solid risk management and holding true to it. Simply buying and index fund and saying “well that’s as good as it gets” is absurd. If you can’t afford an investment adviser then try websites like covestor.com or wealthfront.com (I have no affiliation with either of these by the way) to find an investment style that works for you. If you had bought that passive index fund tracking the S&P 500 back in 2000, then you are still waiting to see a positive return. Ramit, you’re better than a post like this. i looked through your article and have the same issue with tim ferris as thats how i came through to you. the book is based from the US and so much is based toward the talk and products and links. Is there not a way to start up some new books in the UK. I notice you have put your effort into youngsters and i think you are great. Could you do the same in the UK. Have you any friends over here that think the same way. i advise my buy and hold investors to turn off their pc when they have entered a position. Once emotions get involved such as fear, one doesnt think clearly..
I’m a huge fan of automation – protecting people from themselves. Automating your portfolio is a great way to manage risk levels and keep consitency through those more volatile times. I’m self-employed, have been for over 10 years. I’ve received advice from many sources, some cost me money and some saved me money. I created 2 target funds from separate indexes with a five year gap between the two. I arranged them this way because with all the info available I’m scared of retiring too soon or too late, I know I want the money available when I’m ready with no penalty. Rebalancing was something I learned the hard way, that’s why I took my investing in my own hands. Loosing a bulk of your money and having an investor tell you they don’t know why or how is a perfect reason rebalancing should be done more sooner than later.Everyone has had great input thanks for the useful information. Inspirational,educatioal and a priceless lesson. Keep up the excellent work,kudos. Thank you,in sincerest appreciation. Bonds for this crowd? Could we get a post from Ayres & Nalebuff, please? Something that views risk–like the risk of not retiring with enough cash–in a more comprehensive light? Saying “invest in a broad index fund–people can’t pick sectors” begs the question of which countries to invest in. Even the international indices choose some arguably arbitrary weights by which to invest. That said, the big issue here is that people might think they’re diversified if they’re 100% invested in the U.S. It helps that many U.S. companies are multinationals, but that’s still a big bias. I’m interested in moving funds from my online savings account to a brokerage account to apply the 60/40 practice. I would like to pose a question, is there a fund out there that allocates the same 60/40 percentage of US & International stocks and rebalances accordingly? I really like your Venn diagram. We should focus on what we can control in life. Sadly, so many of our economic decisions are based on fear. It is possible (and highly rewarding) to invest in single great companies. I am a fan of Phil Town’s books: http://philtown.com/. I have done so and happy with the results as I now take control of my own investing. I used to buy S/P 500, but it if you get to the root of knowing what a company is worth you come out ahead and it’s fun too! Same principles apply of not having fear when others are running scared. Not to mention although the S/P 500 is diversification, it is still guessing, as you don’t really ever get a handle on much. All the best and thanks for the post! I need some sort of “investing for dummies” book, all this stuff is still Greek to me. Buy stuff in greece now!